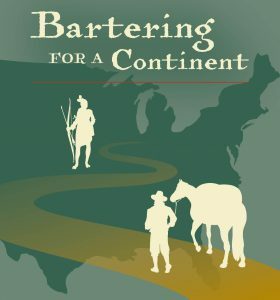 “Bartering for a Continent: How Anglo-Indian Trade Shaped America” will explore the importance of trade between American Indians and English colonists. “Bartering for a Continent: How Anglo-Indian Trade Shaped America” explored the importance of trade between American Indians and English colonists, from the founding of Jamestown through the American Revolution, and the role of Virginia in the development of a new world of exchange in goods and commodities in North America. The six-month exhibition featured artifacts from private and public collections, including a series of 17th- and 18th-century firearms typical of those used in the fur trade during 1650-1800, peace medals used in diplomatic relations, and English trade beads, tools and household items used to buy animal pelts. 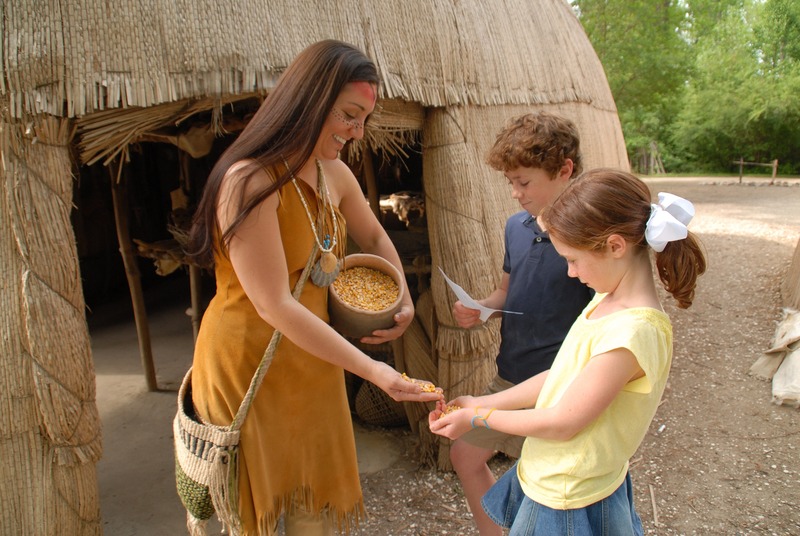 Visitors can test their bartering skills outdoors in the re-created Powhatan Indian village and fort. A variety of interactive experiences encouraged participation in the trading adventure. Visitors could load a canoe with trade goods, then climb in and imagine paddling up a river, learn words of the Powhatan language, compare types of traded goods and their value, and make and take home an impression of a peace medal. Afterward, visitors tested their bartering skills outdoors in the re-created Powhatan Indian village and English fort. 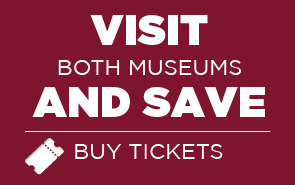 The special exhibition examined English and Powhatan Indian trade at Jamestown in the early 17th century and the expansion of trade networks from the Chesapeake Bay region to the west and south, where connections were made with powerful Indian nations. 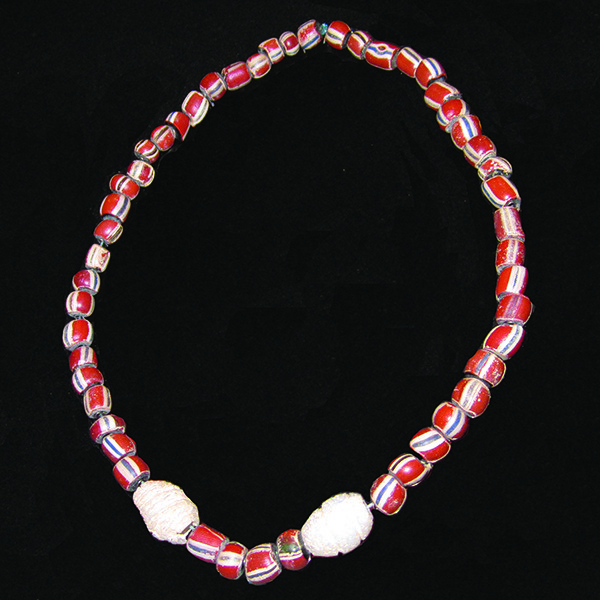 These European glass beads, used for trading with the Indians, date to the early 17th century and were recovered from an archaeological site in Westmoreland County, Va. Jamestown-Yorktown Foundation collection. When the English established Jamestown in 1607, they already knew that America was a land inhabited by others. During the previous century, European explorers, missionaries and traders traveled along North America’s East Coast and had hundreds of encounters with the native peoples, whom the British called “Indians.” An international trade in North American animal hides, especially beaver pelts, existed well before the first colonists arrived in Virginia. Once European colonists came to stay, trade relationships with the Indians became much more complicated. A rapidly growing Anglo-Indian trade network sparked exploration, diplomacy, war and ultimately the seizure of Indian lands for European settlement on a continent-wide scale. Trade drove a far-ranging set of interactions between the peoples of America and Europe that changed not just America but the world. Even though Britain, France and Spain each laid claim to enormous territories in North America, they actually occupied very little of the continent and had to negotiate with the Indians and treat them more like independent nations to retain the Indians as friends and trading partners. 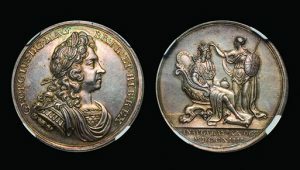 Before the British Government began making actual “peace” medals for presentation to Indian leaders, the British used the coronation medal of the reigning king for the same purpose. In 1721 the governor of Pennsylvania presented a King George I coronation medal, similar to the one shown, to Iroquois leaders as a symbol of peace. Jamestown-Yorktown Foundation collection. Over time, trade and diplomacy converged with the British colonial governments closely regulating the Indian trade and seeking to transform trade relationships with Indian groups into political and military alliances. European trade goods still were exchanged for furs and hides, but these same goods were presented to the Indians as ceremonial gifts to mark the signing of treaties. The “Bartering for a Continent” theme was reflected in a range of special programs at Jamestown Settlement, including Foods & Feasts of Colonial Virginia on November 24-26. Visitors also can take part in the “Search to Survive” app game while visiting Jamestown Settlement’s outdoor living-history areas to learn about cultural intermediaries and trade among the Powhatan Indian and English cultures. The special exhibition was funded in part with a grant from James City County.